For any pet owner that has had to suffer through the bane of fleas, you already know they are a pest to take seriously. Not only are they annoying and potentially dangerous to your family and pet, they are very difficult to eradicate once they establish themselves in a home. There are over 2,000 species and subspecies of fleas that we know of. In the United States, the Cat Flea is the one responsible for nearlyflea problem. In nearly every species of flea, the female is larger than the male. She can lay up to 50 eggs a day and 2,000 in her lifetime (half of which will be female). When the female emerges from the pupa stage she has up to 7 days for her first blood meal. Once that happens she is capable of laying eggs daily. One flea can turn into 1,000 within 21 days and 20,000 in 60 days. Given the life cycle of a flea and the prolific egg laying, not all treatments will work with the stages of the flea’s life. Killing adults may only give you a reprieve for a few days until the fleas are back. 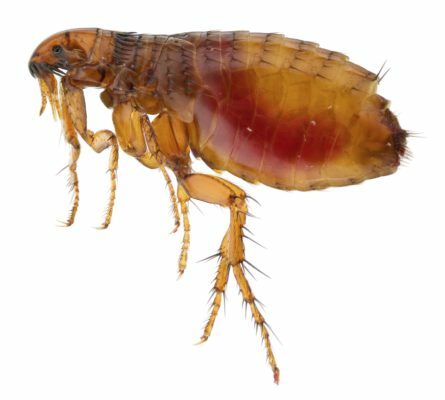 Flea’s bodies are specifically designed to survive in challenging conditions. They have a hard outer coating which means that they are not easily crushed. Additionally, they easily guide their small flat bodies through hair, feathers and animal fur. 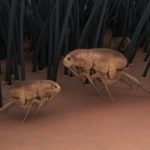 Fleas can withstand cold weather and wait until conditions are right to move into the adult stage. As pupa, the flea can wait up to 8 months before moving to the adult stage. The pupa will wait for conditions to be right environmentally and wait for a suitable host before becoming an adult. If a flea doesn’t have to move around much, it can survive 100 days without feeding. This allows the flea to sit tight and snuggle tightly on their host or in your carpet undetected until they eat again. A female flea can consume more than 15 times her weight in blood daily. That voracious eating habit is what fuels the egg laying to multiply the population quickly. Fleas are excellent jumpers. They do not fly but use their hind legs to propel them up to 200 times their body length. In human terms that would be like one of us jumping over a 30 story building. When they jump, fleas accelerate faster than a space shuttle. In fact, more than 20 times faster. Due to their size and the force used to jump those great distances, their acceleration is approximately 100 times the force of gravity. They have survived for 165 million years. Fossils of fleas have been found from Mesozoic Era (think the Jurassic age with dinosaurs). Though much bigger then (since their hosts were dinosaurs) the flea has managed to survive for millions of years essentially the same way. There are many “do-it-yourself” flea treatment options out there. After reading these facts, you may now realize why often times, those options are just not effective. If you have fleas currently, call your Veterinarian and Modern Pest Services, so that your pet and your house can be protected and flea free.